I love to paint my Art In Wax in all sizes, and the challenge of painting small in hot wax is great fun. I paint as you may know from reading my blog in hot wax, often called “Encaustic Art” I paint using a variety of heat tools, irons and heated stylus tools some of which my husband has adapted to enable me to get more smaller detail into my pictures. 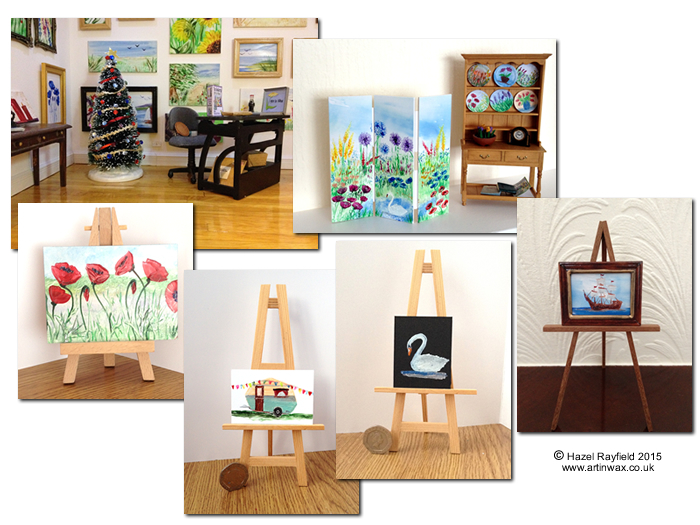 I sell of lot of my miniature Art to Dolls House Collectors and to ACEO collectors too, but miniature Art is not just for Dolls Houses ……..
Lots of people all over the world collect ACEO size Art, an ACEO is a Art Card Editions and Originals and is sized at 2.5 x 3.5 inches, if you would like to know more about this collectible Art form I blogged about it sometime ago here : ACEO and ATC : Miniature Paintings and I still paint ACEO size pictures and also smaller pieces which are suitable for Dolls Houses of various sizes. My Art In Wax Dolls House art is now in many dollhouses and Miniatures properties, from Grand Manor Houses to Country Cottages, from Boutiques and Shops to Hotels and even a Railway Station Pub and they are sold worldwide from my studio here in Southend England, I have had an amazing response to my art over the past few years and last month (October 2015) was a record month with more paintings, large and in miniature going to new homes than any month since I started painting in hot wax over 4 years ago. As well as painting in miniature I love all things miniature, I have my own miniature property, a 1:12 scale victorian shop created by my husband Adrian, the outside is a shop front but inside is a modern and contemporary art gallery Called The Gallery, which this week has a new exhibition of “Christmas trees” seasonal paintings and even has its own miniature Christmas tree. I also have a miniature dresser that has pride of place on a shelf in our lounge and there are of course many miniature paintings in other rooms, my office for example in which I am sitting to type right now !! Contact me for more information ….. Tags: aceo, art, Art Collecting, Dolls House, Miniature Art, miniature artist, Original unique miniature Art. Following on from yesterdays blog post talking about painting tiny miniature paintings for a Dolls’ House commission, I had a very productive day in my studio painting in hot wax. Inspired by one of my own paintings from last year, an A4 sized vase of Lilac style flowers I decided to paint this subject again and in a variety of sizes. Wouldn’t it be fun if you had a painting on your wall in your home and a similar original in your Dolls’ house. Likewise people who collect ACEO and ATC “Art Cards, Editions and Originals” and “Artist Trading Cards” wouldn’t it be fun to have an original in your collection that you also had a similar original on your wall! Painting in hot wax is a medium that is very versatile and yet takes a steady hand especially when working so small, I have already had many comments on my miniature paintings and will be experimenting further with this area as well as painting larger pieces. 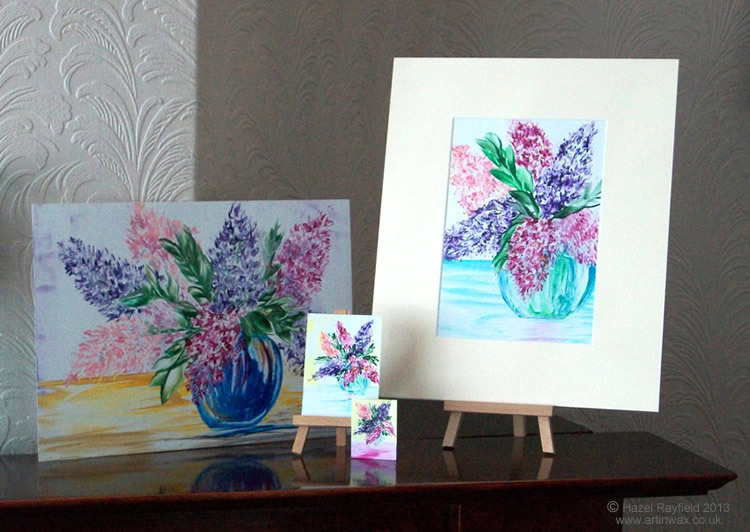 Below you can see the original picture from last year plus created yesterday, an A5 version that I have mounted in a 10 x 12 inche cream mount, an ACEO 3.5 x 2.5 painting shown here on a mini easel and a tiny Doll’s House miniature, ready to frame at just 50mm x 40mm. Art In Wax is available to buy online Via my own shop here on Art In Wax or Etsy. If you would like a piece of original Art In Wax, or a pair of paintings perhaps, for your home, collection and/or Dolls’ House please contact me for more details. When I first started to show my encaustic artwork online a few years ago, I was asked by a lady called Margaret (an ACEO Collector) on an Artists Art chat forum if I painted any ACEO’s. Not knowing what an ACEO was at the time, I did a search, as you do, and found ACEO stands for Art Card Editions and Originals. Having heard about ATC (Artist Trading Cards) before I found that ACEO’s are on off-shoot from these. From my research I found out that as ATC are traded or exchanged, an ACEO can be found for sale. They are very collectible and a popular pastime for many and an affordable way to collect art. A miniature type work of art, an ATC or ACEO can come in a wide variety of styles, materials and subjects. The only criteria is that the size is 2.5 x 3.5 inches. I have a couple of my own displayed in our office on mini wooden easel stands, plus a couple by other artists that I have bought for my husband, I just couldn’t resist them, one is an Owl (he’s so wise sometimes) and the other a F1 car. As we love to be surrounded by art these small pieces are perfect for our busy office as they don’t take up too much space. Although I am concentrating on painting some larger pieces at the moment, I still paint an Encaustic ACEO from time to time, as they are still great fun to paint and I enjoy the challenge of painting in miniature with wax. I first thought of these miniature pictures as ways to show people what could be done in wax and maybe a taster into looking at larger works, but they are an art form all to themselves and a very popular collectable one at that! I have sold quiet a few over the past few years, to collectors in both the UK and US. A few of my Encaustic ACEO paintings, some still mine, others sold and in private collections can be viewed online in a slideshow on the Art In Wax youtube channel which I put together at the end of last year to showcase some of these works. 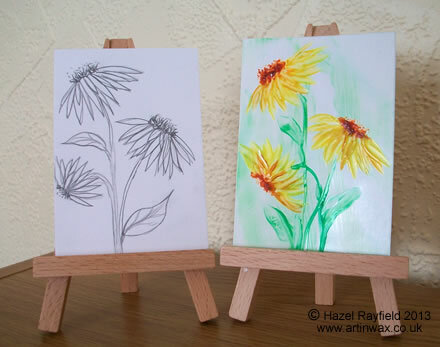 Having written this blog post I was then inspired to paint an ACEO. I haven’t painted one in several months and it was a challenge but in the end I created a couple of these miniature art works. 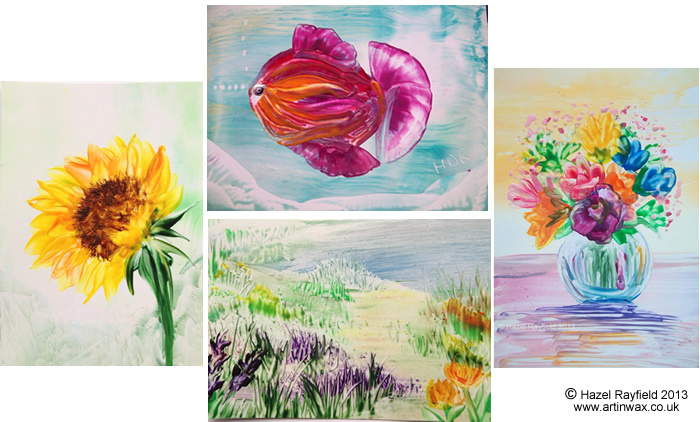 Two new paintings are pictured below : The Sunflower and Landscape are new this week, the fish was painted in 2011 and the flower vase earlier last year 2012. My ACEO’s are for sale, you can contact me direct for details of how to make a purchase via my website contact page form. If you perhaps collect ACEO’s and/or paint and create them yourself or you just found this post interesting do please leave me a comment below, its great to get feedback.